Yesterday morning, as I was running my 9 mile training run, some 26K+ people began running the Boston Marathon. No easy feat to even get in, they have to qualify just to cross the start line. As a runner, I am in awe of those people. Training to run a 10 mile race has not been easy and I can’t even fathom going 26.2. They are running rockstars. As hard as running is, I continue to do it. Non-runners don’t get it. Isn’t it harder than going to a gym class? You know you can burn more calories doing xyz, right? Yes, it is boring at times. It is harder than so many of the gym classes I attend. But nothing – and I by nothing, I mean no other athletic challenge – gives me the sense of accomplishment that running does. And the camaraderie with other runners is amazing. In a race? You may be running alone but you’re running in a community and it’s just such a cool feeling that I can’t even describe it. Running is also a time to just let go of everything else. My mind is always going a million miles a minute. From the time I wake up to the time I go to sleep. When I’m running? It’s almost always only about running. (Probably because it’s such a challenge for me!) But it’s a time to let go of life’s worries, to breathe in the fresh air and relax. To enjoy being alive. To be grateful that you have two legs that can carry you for miles. 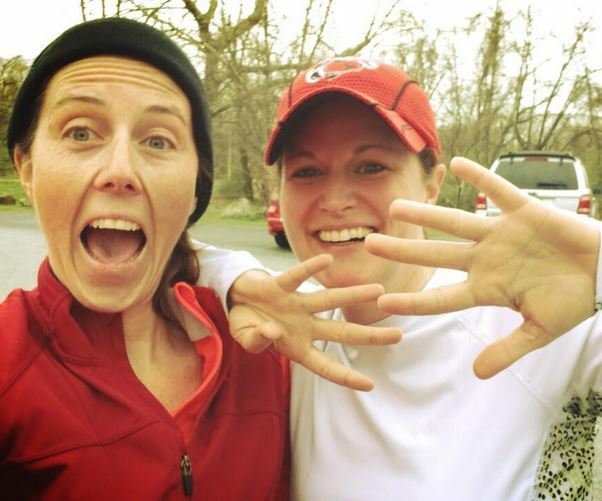 That photo is of me and my friend Dottie after we ran our 9 yesterday. My legs were barely working as we snapped the photo but I was so elated with my sense of accomplishment. Our faces are what should have been on every person who crossed that finish line yesterday. It’s really so hard to swallow what happened yesterday. I can’t make sense of it any more than I can make sense of what happened in Newtown in December. It’s a scary, scary world we live in and I keep thinking about those runners who trained so hard for something totally amazing only to have what happened yesterday happened. My thoughts and prayers are definitely up in Boston right now. I kept thinking about Boston this morning and the upcoming Broad Street Run. I freaked a bit over the mini van that never stopped at the stop sign. And I kept running. I’m freaking a bit about Broad too. Definitely having my family stay home so I know they aren’t anywhere near the crowds. It’s actually more people running Broad Street than run Boston… crazy, right? Whitney, words well put. Such a sense of loss and emptiness. And the question remains: how can this happen. With certainty, evil does indeed exist and no one can begin to fathom what goes on in the sick minds of the ‘beings” that create this. Cannot ever, ever understand the purpose. Yes, prayers and thoughts for all the Boston victims and their families, and for us all actually. Loved your thoughts on this, Whitney! Thanks for sharing. Good post Whitney and I agree that you should leave the family at home. Not good times. Great post! I personally have been antsy about crowds since 9/11 and I hate that “twisted people” did that to me, that they make my mind “go there” like when I was watching the Pope take his place for the first time or the Inauguration, its unbelievable to me the hate and darkness in some people. I didn’t even take my kids to NYC until about 2 1/2 years ago, just because I worried about being in Times Square with that many people and on our last trip we were there riding the rails when that poor man was pushed off the platform. With yesterdays horrific tragedy I am sure I am not alone in questioning events to come. Worst of all, as a parent of 2 kids (8 & 11) I feel at such a loss when they turn their questioning and scared big ‘ol eyes to me asking “WHY would someone do these things”, like yesterday and the CT tragedy. Kids today have to lose their immortality way to fast. My heart goes out to everyone impacted by yesterdays senseless violence. Whit, I am so sad for all those involved and for what these events do to our ability to live our lives w/o living in daily fear. I ran the Philly Distance run in 2001 just days after 9/11 and will run Broad Street in honor of those victims in Boston. But yes, I am scared for our world and pray that we can find peace despite the actions of an obviously very sick person or people. And yes, my kids will stay home too! 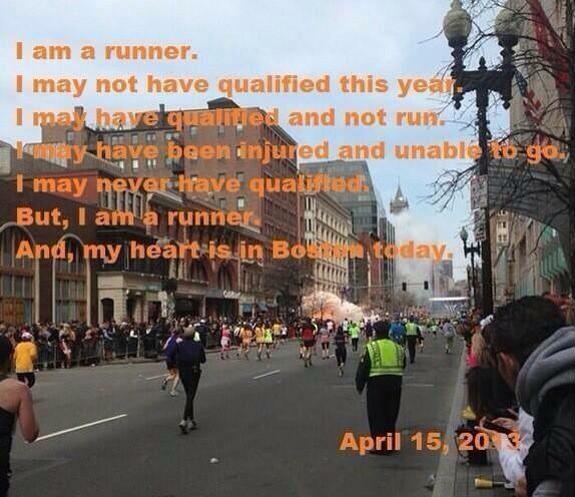 I’m so nervous about Broad but I do love the idea of running in honor of the victims in Boston. Maybe by the time we run there will be a tee or something we can do to show our support while running? That would be neat. I can’t stop thinking about what happened in Boston. My heart goes out to all who are involved. Boston was a horribly executed crime perpetrated by cowards. How, in heaven’s name, can anyone intentionally kill innocents at a hallowed event such as the Boston Marathon. Having been a long distance runner for forty years, having only run one marathon, I can tell you that the folks that qualify for Boston are, indeed, elite runners. In my mind I want vengence on those twisted animals that are responsible for that horrific crime. In my conscience, I pray that The Good Lord shows them the error of their ways, and brings them an understanding of the love that is there for anyone that reaches out for it. To you guys that want to protect your families, I hear you. As Americans, we don’t take this crap. We fight on. We push back. Do what you do – with care. Don’t let those cowards intimidate you. Show them our mettle. God Bless America!